"'A 3 percent remedy' for our immigration ills, real or fancied, will restrict the admission of aliens from May of this year to June, 1922, to 3 percent of the total of each nationality in this country when the Federal census was taken in 1910. As passed by the house, and expected to pass the Senate, the new measure, except for the time limit, is identical with the Johnson Bill passed in the last session of Congress and killed by pocket-veto of President Wilson." "But the Johnson Bill does not set up a permanent restrictive policy; it is intended merely to protect this country for the next fourteen months from a horde of Europe's most objectionable classes." 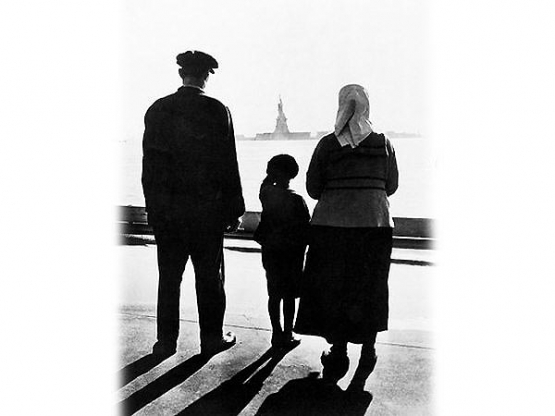 One hundred years ago the U.S. Government processed immigrants through a quota system - entry would be granted if the applicants arrived before the quota amount arriving from their country had not been reached - and if they passed their physical examination. The immigration agents did not accept one nationality for citizenship officially while permitting hundreds of thousands from this same country to reside illegally, as is the practice today. The attached column pertains to how unfair the quota system was and how it tended to break-up families. President Harding's response to this issue is quoted. "...many would-be immigrants arriving at the port of New York had been refused admission and been sent home again, because they had happened to arrive a few hours after their country's legal quota for the month..."
In an effort to keep the writers and actors of the Works Progress Administration busy, FDR's Department of the Interior produced a 26-part radio program intended "to prove that America could never have become so great without the contributions" of all the various hyphenated groups that make up the country. On Sunday afternoon throughout much of 1938, Americans could gather around their radios, if they had them, and hear their "identity groups" being praised by the Government: African-Americans tuned in on December 18th; the WASP show was on December fourth. "If you go to Aala Park... you will see a kid's baseball game in progress - on one side two or three Hawaiians, a white or two, a Chinese, a Japanese, a Portuguese, and on the other two or three Hawaiians, a Korean, a Filipino and two or three that have mixtures of Hawaiian and Chinese or Filipino or American. You will hear baseball slang with Chinese modifications and coaching from the sidelines in an exotically flavored English, while in moments of high excitement encouragement is shrieked in the various native tongues..."
Sounds kind of charming to us. The anonymous journalist opened this 1935 magazine article explaining how the Indian caste system took root and reasoned as to why he believed such a system was an inevitability in the United States as well. "With the California Council on Oriental Relations waging an eloquent campaign for repeal of the Japanese Exclusion Act, a quota-basis solution is suggested." You might also be interested in reading about the Yellow Peril in Canada. "For all my life I've wanted to be an American. I've dreamed about it, studied, worked for it...I've been an American for only a few days. But if I could have one wish it would be to go up to everybody I meet and say: 'Aren't we lucky to have this chance! Let's never forget it.'"